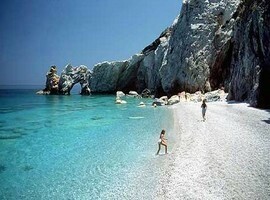 Skiathos is a lush, green island with over 60 beaches. 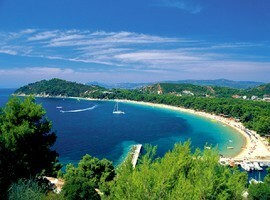 Depending on where you live, you can just relax or make excursions do sports and enjoy the nightlife. 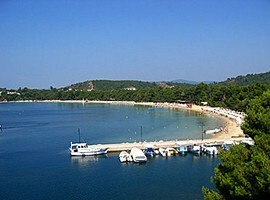 The capital of Skiathos has managed to retain the traditional style, even though every summer thousands of visitors enjoy what it has to offer. As you arrive in port the first thing you notice on your left are the old shipyards, while nearby there is a large lake which also has thousands of visitors each summer – the lake is habitat for thousands of birds that arrive there during the summer migration . 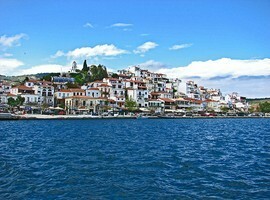 Skiathos town has many interesting churches. One of the most important is the cathedral which has many relics and images from all the other churches of the island and kept in there. 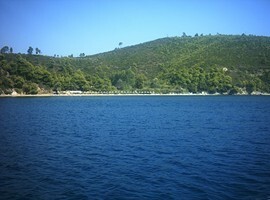 Another interesting church in Skiathos is the church of Panagia of the Lake. 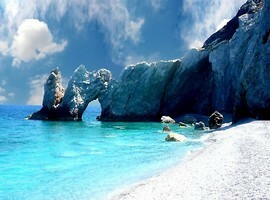 Here is a shrine dedicated to Alexander Papadiamantis, the famous author of Skiathos. 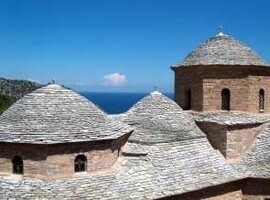 You can also visit the beautiful church of St. Nicholas and St. Fanourios. 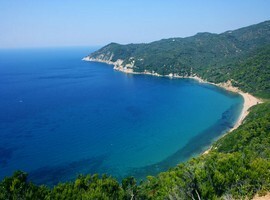 From these two beautiful churches you can enjoy the magnificent view of the castle of Skiathos. 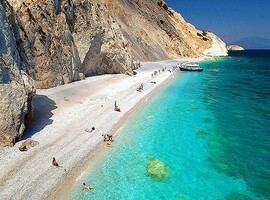 The island is one of the few islands in Greece that has never changed its name. 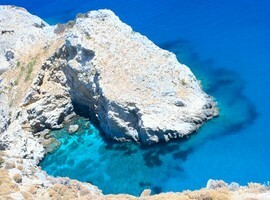 The name might have derived from a theory that is a pre-Greek name given to the island from the first inhabitants. 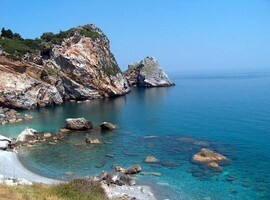 Another explanation is that it comes from the Greek word for shade because of the many trees, or that the island lies in the shadow of Mount Pelion, because it is relatively close to the mainland. 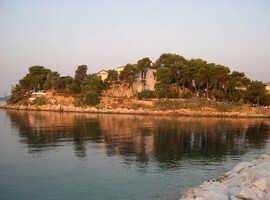 The island has been inhabited since prehistoric times. The island has a tradition of shipbuilding and along with its fertile land it became an important resting place for travelers. 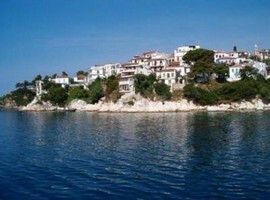 In Skiathos town there is the old town with small winding streets and traditional houses. 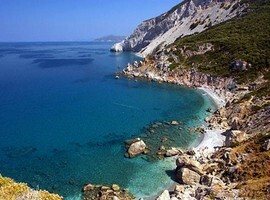 There is also Bourtzi, a small peninsula to the port used by the Venetians as Citadel and remains intact from the 13 century with its wall and canons. 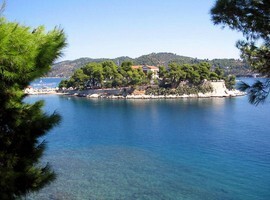 You can enjoy concerts there, art exhibitions and puppets for children at the summer theater. 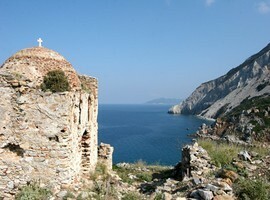 The monastery church Evangelistria is located 30 minutes drive outside of town. It has a really beautiful place and is open to the public. It also has a small museum with various objects from its history. There is also an excellent shop here where you can buy icons, crucifixes and even wine. 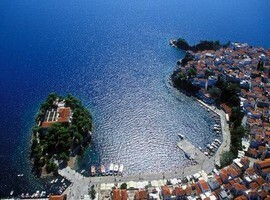 You can also visit the medieval capital Kastro, go around the island by boat or by car and then on foot. Do not forget to visit the Church of Christ and the old houses. 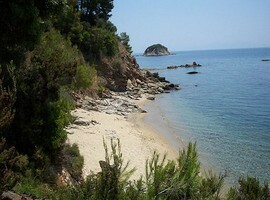 There are water sports at many of the beaches, for example in the Great Sand close to the town, Koukounaries and Ag. In town there are tennis clubs. 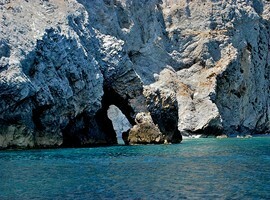 You can also go horseback-riding near Koukounaries. There is also a diving center. 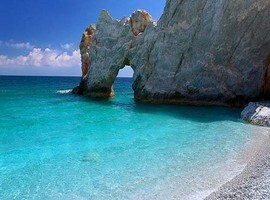 Although Skiathos is a small island, has more than 60 beaches, and at least one for every taste: Koukounaries is one of the most famous beaches in Greece, a long sandy beach with beautiful surroundings, restaurants, snack bars and water sports, Banana Beach, which is known as a nudist beach but the fact is that only a part of it is nudist, Agia Paraskevi is a perfect beach for the family, Lalaria, a beach with white pebbles can be reached only by boat. 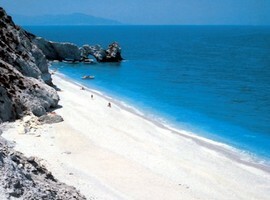 The north side of the island is quite windy and the beaches are not so suitable for children.